Quick Take: If you’re familiar with online mattresses, you know the names Leesa and Ghostbed. If you need to know more about either mattress, you’re in the right place. 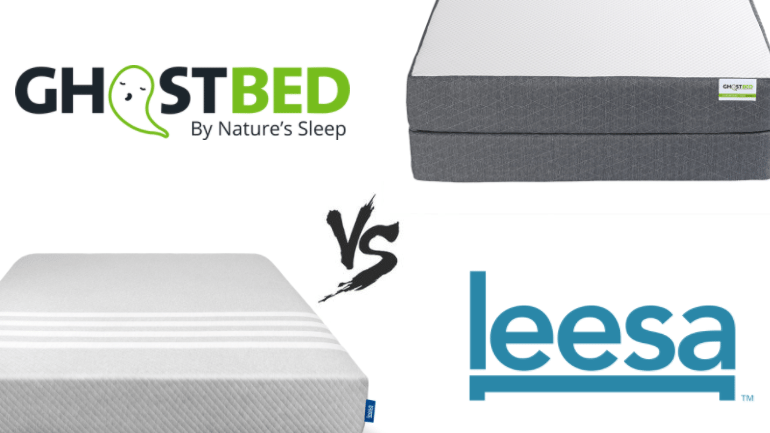 Once you’ve looked at some reviews, this Leesa vs Ghostbed mattress comparison can help you give both brands a more serious look. You’ll get a chance to determine which price is in your budget, how each mattress is constructed, and what bed offers a better bounce. So, if you want to know more about these popular brands, keep reading this Leesa Ghostbed comparison. Check out our full review for Leesa and Ghostbed here! Before getting too far into this Leesa vs Ghostbed mattress comparison, for clarification this comparison is about the classic models of both Leesa and Ghostbed. While both brands offer other mattress models, this Leesa Ghostbed comparison is just for the original models. If we compare other models, we will be sure to offer the full mattress name to avoid any confusion. There are plenty of good reasons to buy your mattress online. For starters, most brands offer a risk-free trial that gives you a chance to get your money back if you’re not satisfied with the bed you choose. Additionally, online shopping means less overhead and that equals lower prices for shoppers. Both Leesa and Ghostbed are reputable brands that offer beds that almost anyone would be happy to own. Leesa is a company that has been around since the beginning of the online mattress revolution. They are known, at least partly, for the number of mattresses they have donated. For every ten mattresses they sell, they donate one to someone in need. Of course, you shouldn’t just buy a mattress because of the company’s ability to do good. You want something that’s going to be comfortable and this Leesa vs Ghostbed mattress comparison will help you look at the factors that are important to you. This is your chance to learn more about both brands. Leesa mattresses are 10” thick and made of three foam layers. The mattress starts with a 2” layer of patented Avena foam. This foam is made of latex, which is going to add durability and a better bounce to your mattress. The next layer is a 2” layer of memory foam, which will help with pressure relief and add support. The last layer is the foundation of the mattress. This layer is 6” and it’s made of high-density support foam. If you’ve had problems with memory foam in the past, you’ll find that Leesa offers the best of memory foam and the inclusion of the other foams removes all the bad things about it. Before you get into the layers of the Ghostbed mattress you will find yourself resting on a luxuriously soft cover. On the inside, the mattress starts with 1.5” of aerated latex, which will add bounce and keep your mattress cool. The 2” gel memory foam will also help to keep things cool, while also relieving pressure and making the mattress more comfortable overall. Finally, the 7.5” high-density support base will bring the whole mattress together. One of the benefits to both of these mattresses is that most sleepers will be comfortable on either mattress. Both mattresses are designed to handle all of the major sleep positions, which means side sleepers should be just as comfortable as back sleepers or combination sleepers. Ghostbed mattresses are medium-firm. The benefit of a medium firm mattress is that it is going to work for most sleepers. This particular mattress is a little bit on the firmer end of medium-firm. You can expect it to be firm enough for stomach sleepers, but still soft enough for a side sleeper. This is a great mattress for couples, because if you sleep in a different position than your partner, this mattress will be able to handle both styles. Leesa is also considered medium-firm, though it is softer than Ghostbed. If Ghostbed were a 6.5 out of 10, Leesa would be a 5.5. This means that while it’s soft it also has a little firmness to it. You shouldn’t sink into the bed too much and there should be enough firmness to keep you comfortable in most sleep positions. One of the benefits of Ghostbed is that it uses latex. The combination of the latex with other foams isolates motion on the bed, so you won’t feel it on the surface. That means that if you find yourself moving throughout the night, it shouldn’t wake you or anyone else up. Many report that they end up switching positions less because they are more comfortable on their new mattress. However, if you still move you can know that it won’t disturb anyone when you’re doing it. Like Ghostbed, few complaints are reported about Leesa when it comes to motion transfer. The process is essentially the same, with the foam breaking up the motion energy so that you don’t have to feel it on the surface of the mattress. This certainly makes these mattresses good choices for couples because you won’t bother one another in the middle of the night. Leesa may be a little more expensive in comparison to Ghostbed, but it’s still a cheaper alternative than many other mattress options out there. If charity is important to you, the fact that they give a mattress away for every ten sold will likely be something you’re fond of. At the end of the day, Leesa is a high-end luxury mattress and it’s available for under $1,100. If there is a coupon code available, you can save even more on a Leesa! While there is nothing wrong with Leesa’s prices, Ghostbed’s are lower. In comparison, Leesa’s King mattress is $1,070 and a Ghostbed King will cost you $995. It’s rare to find a latex and foam mattress at a price this low. Ghostbed also offers deals and coupon codes throughout the year, which can help to keep prices even lower. Leesa wants to make sure you’re satisfied with your new mattress. The easiest way to do this is to give you a chance to change your mind. For this reason, Leesa offers a 100-night risk-free sleep trial. If you’re unhappy you can contact Leesa and they will take your mattress back. If possible, they will donate your mattress to someone in need and you’ll get your money back. Otherwise, your mattress will have a 10-year warranty that protects against flaws or mattress defects of any kind. Ghostbed also has a 10-year warranty, which is similar to the one offered by Leesa. You’ll want to check the Ghostbed warranty for specifics, but it protects against any factory problems and other issues. Ghostbed also offers a risk-free trial. The difference between Ghostbed and Leesa is just one day. The Ghostbed risk-free trial lasts 101-nights. The entire experience is hassle-free. Just let Ghostbed know you’re not satisfied and they will refund your money so you can get another mattress. If price is a major factor for you, this Leesa vs Ghostbed mattress comparison will be won by Ghostbed. Alternatively, if you want a softer mattress, Leesa is the clear winner. Both mattresses are good options. At the end of the day it’s going to come down to things like how soft you want your mattress and how much you want to spend.